Article Courtesy of Bob Wildes. This article is being written not only to present an excellent bench press routine, but also to share a philosophy of lifting and a method of setting workout goals. I've been wrestling and strength coach at Republican Valley High School for the past 10 years. During this time I have been exposed to various philosophies for training athletes. None have been more interesting or more valid to me than the Russian Theory of coaching wrestling. The Russian Olympic wrestling coaching staff works backwards from conventionally used methods. That is, they begin by setting their final goals and objectives, then work backwards from the day before the scheduled meet in planning workout routines and short range goals. I have been applying this same theory to my bench press routine. I establish my desired final goals three months in advance of the day of competition. I then begin working backwards, knowing that in order to achieve a workout (set-rep-poundage) goal for a certain workout, the prior workout (set-rep-poundage) goal must be achieved. In other words, workouts have been geared in a manner that enables the lifter to build on each week's progress until the final goal or ultimate max lift has been made. In order to achieve success with this bench routine, the lifter must be intense and goal oriented toward every set and workout. 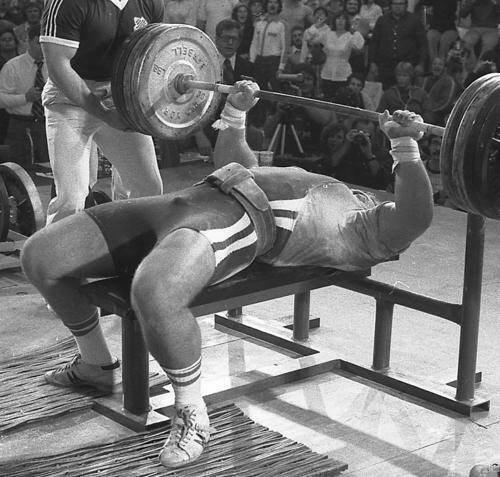 This bench press workout is a slight revision of my mini-cycle bench routine from 1981. I have eliminated singles and reduced the number of sets as the meet grows nearer. the reason for these modifications is that the lifter is handling heavier weight in the last phase of the cycle which poses a threat of over-training if the number of sets are not reduced. I still do not recommend inclines, flyes, or military presses unless they are used during the off season. three months before the meet, the lifter needs to be hitting the bench press hard, and the use of other assistance movements will result in overtraining. Triceps extensions re great as a supplement to the bench press. I hit about 5 or 6 sets of triceps extensions on an incline bench after my Thursday workouts, but if I experience much tenderness of the triceps insertions at the elbow, I'll reduce the triceps work or just do cable work once a week. I continue training triceps until a week before the meet. My best competition bench resulting from this routine has been a 450. If a lifter is capable of benching 400 with a pause, then he should be able to add and additional 25 to 35 pounds on his bench. Success is contingent training intensely and following the routine closely. If the prescribed workout poundages appear to be too light at first, don't increase weight, but make each rep harder by incorporating pauses that may vary in length from one to 10 seconds. 1) Warm up before you hit your workout sets. I like to go 135 x 8 and 225 x 8. Warming up is an individual thing, and you have to do what is right for you. 2) You must be goal oriented toward every set and every rep in all of your workouts. Think about your upcoming workouts, and when your bench day arrives, attack the weight with as much intensity as you can muster. You must attack the weight like you would attack any other opponent. 3) Use good form on ALL OF YOUR SETS, and employ pauses frequently. 300 x 1 (10 second pause). 310 x 1 (10 second pause). 315 x 1 (10 second pause, increase your last lift each workout by 5 lbs. for a 10 second pause). The paused single as explained above. Repeat Week 6 Monday workout. Repeat Week 8 Monday workout. 3rd Attempt - 435 to 440.